Jam organizer Mathilde Leo is always eager to hear others' stories to improve the way she gets things done. Mathilde Leo is a Product Manager who from her personal need and passion to learn more about her profession created the conference JAM. Now, three years later, JAM is one of the most loved product conferences in London. JAM and Refresh have a lot in common - we both aim to create a relaxed and friendly space in every detail and we believe in the power of sharing stories. We sat down with Mathilde and asked her to share her ideas on what's the value of conferences and how organizing one is a bit like building a product. Can you tell us a bit what is your motivation behind creating and running JAM? How did you end up doing it in the first place? It all started when I got my first job less than 5 years ago. I joined an ad-tech startup as a product manager. Like most people, I fell into the role and learned through trial-and-error. With my team, we often asked ourselves how others did it. You know, companies like Google, TransferWise or Deliveroo – how THEY do things? How do they decide what to build? What goes on behind the scenes? So with my colleague Seb, we decided to start JAM. The idea was simple: learn how our favourite products were built behind the scenes – and find out how other people addressed the same challenges we were facing. Our first conference back in 2015 was the very definition of a side-project. We worked on it during weekends and had no idea what to expect. We were amazed by the turn out and the diversity of the crowd. 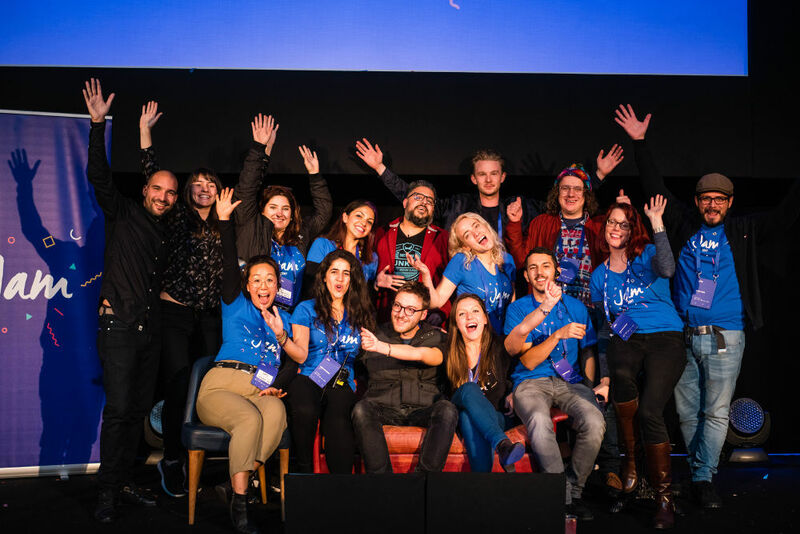 Fast forward to today: it has become the go-to product conference in London, gathering 600 of the best product managers, designers and founders in town for a day of stories, street food and great chats. Why do you think people should attend conferences? Learning from others – From the speakers to the crowd itself, it’s a fantastic opportunity to have conversations that will change the way you work. Meeting new people. Seriously, (great) conferences gather (great) people under one roof. Forget about networking, you’re not at work. Genuinely talk to people, have a laugh and relax. Don’t forget to mention any exciting product idea or side project you have, though. Who knows, you might end up building things with these people in the near future. Bonding with your team. If you’re heading to a conference with colleagues, it’s the perfect time to let off some steam and get to know them. You’ll have some fun together but will also get the chance to have an open conversation about the way you work (and what you need to improve as a team). A lot of people actually asked us for a hand convincing their boss to attend JAM. So we created this handy guide. There are a lot of tech events out there. What’s your advice to choose the right one to attend? The speakers: are they professional or practitioners? The most seasoned speakers often give the same talk on multiple occasions. Chances are they’ll shine on stage. This also means their content can probably be found online. With non-professional speakers who’re talking about their work, you’ll hear less polished ‘concepts’, but perhaps more relatable ones. Nothing is better, but ask yourself what you’re after. The talks: are they top level, big thinking talks or more practical? What key takeaways can you expect by looking at the schedule? Again here, your preferences will depend on what you’re hoping to get out of the event. The food: seriously, if you’re going to spend a few hundred euros on a ticket (or valuable company budget), you deserve more than a sandwich or a tasteless salad. The extras: what does your ticket include in addition to the talks? Is there an after-party to connect (and dance) with other attendees? Beyond just the talks, the value of attending is often the people you meet and end up working with, the teams you share ideas with and the genuine conversations you have with attendees. You can also look out for past videos of the talks and trailers, they’ll give you a good sense of the general vibe of the event. Jam London attendees highly value the conference's friendly atmosphere. As a community builder, you probably get to talk to a lot of product people. What are the biggest trends or shift you are seeing right now in that community? The rise of the ‘full-stack product maker’. Alright, beyond this cheesy, made-up title, I feel there’s a trend for (great) product people to combine multiple ‘hard’ skills in their toolset: prototyping, UX, coding, growth, data analytics etc. This is related to the rising trend of ‘Indie Hackers’, solo-entrepreneurs who’re turning their ideas into profitable side businesses by doing everything themselves. The community of the same name is a goldmine of tips and stories on how to do just that. Has organizing JAM also somehow helped you grow your PM skills? How? Definitely. First, let me say one thing. The best part about organising JAM is getting to meet so many talented product people and their teams. There’s nothing better than hearing other people’s stories to improve the way you get things done. Then, I’ve definitely become more organised through organising the conference. When you run an event for 600 people, and most of them are designers, you have to polish every detail. Ultimately, we’ve treated JAM like a product, so I definitely got to exercise my PM muscles during the entire process. Every year, I’m hunting down the best speakers and curating the most interesting stories to be shared on stage. This involves asking myself, ‘what does the community really need help with?’, ‘will this particular talk resonate with them?’ It’s also about finding the sweet spot between the different levels of experience and backgrounds represented in the room. To get things right, we think about ‘audience personas’ and make sure we plan the content with them in mind. Then, there’s the delivery element. How can we delight people? Not just satisfy them on the day. It’s about designing an experience, not just a conference. Every year, we improve based on feedback from the audience but also our own evolving needs as product people. Jam is all about sharing experiences and making new connections. Do you have a vision where conferences should be heading towards? Is it a dying format? If by conference we mean sitting in an auditorium and being fed content’ then yes, I think this format is a thing of the past. For this, we already have books, videos, blog posts and even inspired twitter accounts. What we need is to hear genuine, unheard stories, to learn from people just like us who are trying to build something great. The talks are just one way to share these stories. The real magic happens in between, when you connect with someone who’s facing the exact same challenge, or someone who can give you a hand because they’ve been there and done it. That is why we’ve started planning community experiences: think relaxing ‘retreats’ or activity based events (psst, one of them will take place in Barcelona!). We want to create events where people can have meaningful interactions with each other, events that are blurring the lines between work and play, conference and holiday. Let’s face it, talking about prototyping over sangria sounds like a lot of fun. Stay tuned.